Patients with malfunctioning valves of the lower leg veins frequently experience pain, swelling, throbbing, burning, and itching. In severe cases, skin changes may develop, leading to the breakdown of the skin and ulcer formation. Usually, the first sign of a problem with the venous valves is the development of varicose veins or grapelike, bulging veins that can be seen just under the skin. When the venous disease is found to be caused by poorly working valves, that segment of the vein can be closed with endovenous ablation. For the best treatment for varicose veins in Mobile, AL, come to O’Gorman Vein and Vascular. 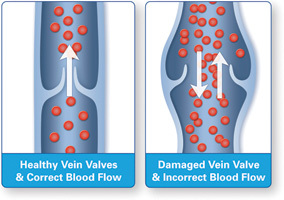 Our clinic utilizes this technique to treat veins with malfunctioning valves. During this procedure, we insert a thin fiber into the vein through a small needle puncture and position it with ultrasound guidance. 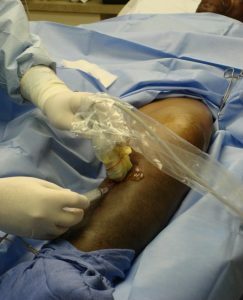 We then administer heat using a laser or radiofrequency source to close the damaged vein segment. The procedure is also known as endovenous ablation (EVA), radiofrequency ablation (RFA), or endovenous laser ablation (EVLA). Most patients recover in a few weeks form this varicose vein surgery in Mobile, AL. We perform this procedure in the office setting and encourage our patients to walk immediately afterward. Our doctor frequently combines the endovenous ablation procedure with ambulatory microphlebectomy or sclerotherapy. Microphlebectomy is a procedure wherein we place a small needle in one of the more superficial veins before inserting a tiny hook through the needle hole to disrupt the vein so it closes. With sclerotherapy, we use a small needle to inject a solution into the more superficial veins, causing them to seal closed. Contact us for more information on our laser vein treatment for varicose veins in Mobile, AL. We provide treatment for patients in Mobile, Alabama, and the surrounding areas.